By Jessica Cantarelli Community Member	July 14, 2009 at 3:02 p.m.
Like a lot of families, Mark Damisch, along with his wife and two daughters are gearing up for their annual summer vacation. However, the Damischs vacation wont include factoring in gas prices, road trip games or stopping on their route to see the worlds biggest ball of twine. Rather, they will explore the beaches of Normandy, play concerts for hundreds in well-known European landmarks and perfect their foreign language skills. The Northbrook family has been performing concerts internationally every summer for the past nine years. 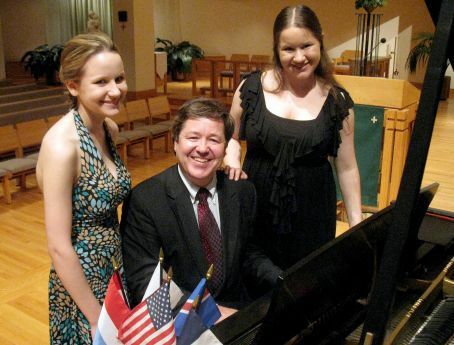 Mark Damisch, who plays piano, along with his singing and piano-playing daughters Katherine, 19, and Alexandra, 14 will go on tour once again this year. This years tour, which begins July 16 and runs until Aug. 9, will span France, Luxeumbourg and Iceland. I started touring in the 1970s doing friendship tours and spent a lot of time in Eastern Europe and the Soviet Union to reach out to people behind the iron curtain, Mark Damisch said. In the last 10 years, its been to do concerts to raise money for various charities like the Red Cross, among others. The Damischs performed a preview concert for locals at St. Paul the Apostle Church in Gurnee July 8. More than 30 people attended the concert, which benefited Lake County Habitat for Humanity. The concert featured highlights from the upcoming tour, anecdotes from previous tours and brief explanations and back stories about the familys musical history and concert pieces. Mark Damisch, a Northfield native and New Trier High School alumnus began playing the organ when he was 4 years old piano at 7. At 17, he traveled to Europe to perform with the Vienna Choir when he became interested in putting together a tour of his own. I was walking through the Mirabell Gardens, where the Sound of Music was filmed and thought that if a high school choir can put together a tour, why couldnt I, he said. I wrote 800 letters on an electric typewriter with carbon paper and sent them out everywhere. 780 of them came back saying no and 20 of them said yes. And that was back in the old days before e-mail, so it took six weeks for a letter to get overseas and six weeks for it to come back. Now, at 53, Mark Damisch has traveled all over the world to play concerts in the name of peace, friendship and charity. Damisch has also served his community as Northbrook Village President from 1993-2005. He said with all of the roles hes filled, they all have the same mission: to make the world a better place. I feel its important to do good in the world, he said. Every tour means something different to me. When I was in Russia, it was meaningful to me because I have an understanding of Russian history and culture. When we were in Jordan, Israel and Egypt, it was meaningful to us to bring the American culture to the Middle East. Many of them dont hear American music, and it feels good to go ahead and bring some new experiences from a musical standpoint. Although ticket sales from this years tour will directly benefit the venues where the Damischs are performing instead of a named charity, he said that most of the time, the tours are funded out of pocket. This year, the Damisch family will perform pieces with French flare, as the inspiration for their lineup is the 65th anniversary of the U.S. liberation of France in World War II. Mark Damisch said he chose a number of French songs that audiences will know, including Gershwins An American in Paris, the Chopin Waltz No. 10 and Edith Piafs Le Vie En Rose. The pieces range in length from two to 22 minutes. It sounds like its all glamour and glitz when you put a tour together, he said. Its a lot of hard work, with hours of sound checks and practices and preparation. We play for audiences that range in size from 50 to 1,000 people, so a lot goes into this. But, we have a good time, we think were doing good things and taking the name of the U.S. around the world. Mark Damisch said the tour is not only for audiences who enjoy the performances, but its a way to create a bond for his family as well as to be able to give his children a rewarding experience through international travel. This is something that Im able to share with my kids that few parents have been able to share, he said. When we go overseas, I encourage them to bring a message of friendship and to be an ambassador for our country and represent our culture and values in a positive way. Its a good feeling for me. Katherine Damisch sang Amazing Grace, La Vie En Rose and Blowing in the Wind with piano accompaniment from her father during the preview concert. She said she looks forward to touring every year, despite all the hard work and months of preparation and practice that go into planning the tours. I think its a nice way for us to help people, because our whole endeavor is based on our family performance, Katherine Damisch said. Alexandra Damisch also sang and even played piano during the preview concert. Her favorite part about performing locally as well as touring around the world she said is to help people through peace and music. Weve seen so much of the world, and the audiences we perform for have given us a multicultural understanding, she said. Its a great gift and an awesome opportunity. I think the best thing we can do is to show kindness and dignity to people and uphold the message of peace.